Poland's ambassador to Iraq has been injured in a bomb attack on his convoy in the capital, Baghdad, officials say. Polish officials believe the attack on the three-car convoy in the city centre was a deliberate assassination bid. Ambassador Edward Pietrzyk does not appear to have been seriously wounded and is now in hospital. One civilian was killed and several others were injured in the attack. Poland backed the 2003 US-led invasion in Iraq and has about 900 troops there. A total of 21 Polish soldiers have been killed in Iraq since the war began. The Polish Prime Minister, Jaroslaw Kaczynski, said the attack on the ambassador would not prompt his country to withdraw any troops. The diplomatic convoy was attacked at about 1000 local time (0700 GMT) in the Arasat district, officials say. All three vehicles were destroyed by the explosion, thought to be from a car bomb. Ambassador Pietrzyk "was able to leave the scene himself", Polish foreign ministry spokesman Robert Szaniawski told the AFP news agency. He was taken to hospital in the heavily fortified Green Zone but his injuries are not thought to be life-threatening. At least one embassy official was also injured in the attack, officials say. The area was sealed off by Iraqi police. Mr Pietrzyk was appointed as head of Warsaw's diplomatic mission in Iraq earlier this year. 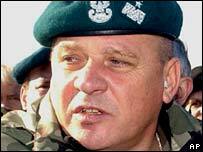 He was the commander of Poland's land forces in 2000-2006. 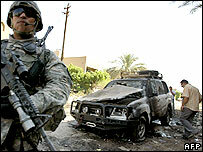 Several foreign diplomats have been killed by Iraqi insurgents since 2003.